Traditionally, Japanese couples had arranged marriages and the ceremony took place in a Shinto shrine. Although some couples still observe these customs, weddings in Japan are changing. Many couples are falling in love, so the marriage is not arranged. Often the Japanese who are younger wish to incorporate some of the Western style elements they see in other weddings, such as toasts and candle lighting ceremonies, speeches and songs. However, Japan is a very formal and structured country, so although some Western ideas can be brought into a wedding there, quite a few formal rules must be observed. This article explains what a wedding which is a mix of Japanese and Western customs might be like. Japanese wedding ceremonies have been changing quite a bit over the years. The old fashioned one was a Shinto ceremony, held in a shrine, with only the immediate family in attendance. Apparently, the Japanese have decided they wanted to mix in some Western customs as well. So, today, a wedding ceremony in Japan is usually a mix of Shinto, Christian, and Buddhism, even though the religious part is not taken all that seriously. Most Japanese weddings happen in the Spring or Fall. Traditionally there are two ways to find a marriage partner in Japan. A miai is an arranged marriage, or one that results from other people introducing the couple and hoping they may decide to marry. The amount of miai matches has dwindled quite a bit in recent years. But some couples still opt to choose this type of wedding. The traditional wedding customs, or shinzen shiki, entails an elaborate ceremony in a Shinto shrine. The Japanese Bride to be is painted white from head to toe, to declare her status of maiden to the gods. She can choose from two styles of headwear. The first is a white hood, or wataboski. The second is a tsunokakushi, made larger to “hide the woman’s horns of jealously.” This symbolizes a Bride’s intentions to be an obedient and gentle wife. 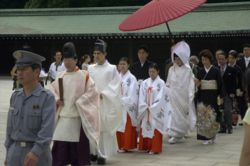 The Bride would be wearing a white kimono for this type of wedding ceremony, and the Groom would be wearing a black kimono. When weddings were all performed according to the Shinto ritual, the wedding union was allowed to be blessed by a priest, giving legal or official recognition, although this person had no legal authority. Mother Almost Ready To "Give Away The Bride"
A whole industry has sprung up to provide couples with wedding ceremonies modeled after Western ones. The Japanese weddings are often still held in a chapel of some sort, but they do not view religion an important part of the marriage ceremony, it is seen more as a fashion statement. This is not viewed as being contradictory, and couples do not care if Buddhist, Shinto, Christian or other customs are mixed together on their special day. Those who receive an invitation to the wedding must return the enclosed card to let the couple know if they will be attending or not. If one is attending a Japanese wedding reception, cash is the expected gift. The amount depends on your relationship with the couple, and the region, though it is acceptable to ask other guests what they are giving. The average amount is 30,000 yen for a friend’s wedding. The cash must be enclosed in the special envelope provided with the invitation, called a shugi-bukuro, and the giver’s name should be written on the front. It is considered polite to put new, unwrinkled bills without creases in the envelope. It is then handed to the person at the reception desk when the guest signs the guestbook, on arrival at the ceremony. A renai is when the two people meet, fall in love, and decide to marry on their own. This is becoming much more common in Japan now, and they have added many features of a Western wedding to their own customs. But Japan is a very structured, formal society, so although the ceremony “borrows” certain features that might be seen in the United States, the Japanese wedding is very structured and formal, with no spontaneous gestures. The one thing that is similar is the price, and Japanese couples are also finding weddings to be getting more and more extravagant. Japanese formal occasions have many controlled rules, and everyone must conform to them in an exact manner, or the families will be shamed. Every single detail is planned, and nobody is supposed to deviate from that plan. The first thing the couple must do is to file for marriage at a local government agency. But the couples do not really require a marriage ceremony at all once they have submitted the required documents to the city hall registrar. Their name and family status is changed in the registries at that point, so they are already legally married. So whether the ceremony is Shinto, Christian, Buddhist, or non-religious, the style of the ceremony itself has no legal purpose. The couple just wants to have all the hoopla they see in Western style weddings and receptions. So the result is a highly planned and timed version of that. Most of the female participants in the big day get ready at the beauty shop which is often located at the catering hall or hotel where the shrine is too. The Bride needs more time to prepare, of course, because she is often wearing an extravagant kimono, heavy makeup, a wig and a head cover, though that is going out of style. She will also be required to change outfits two more times during the reception. The Groom will be wearing a black kimono. If the Bride chooses to wear more Western attire, the Groom will wear a black tuxedo. The guests begin arriving about one hour before the ceremony. The Bride and Groom are getting help with dressing in separate rooms with close relatives, and will be kept apart until the ceremony. Relatives will be at the religious part of the ceremony, and an assistant, called a kaizoe, explains each step to the family. There will be many family photos, and this is considered a big part of the wedding day. Photos of the Bride and Groom and their families, represent the couple’s prospective future together. The Japanese Wedding Ceremony and reception follows a specific set of rules. Many hotels or large catering halls already have shrines in them, making it convenient for couples to begin their reception immediately after the wedding itself. There is normally some sort of rehearsal before the big day, as in the Western custom. There are no Bridesmaids or Bridegrooms, there is usually an older couple who “sponsor” the newlyweds, called nakoudo, or matchmakers. The wedding day itself goes something like this: The Bride’s Mother lowers the veil her daughter is wearing, before “giving her away,” and her Father walks her down the aisle. The Bride sometimes wears a wedding cross, with interlocking rings attached. This is symbolic of sharing the lives together in the bonds of matrimony. 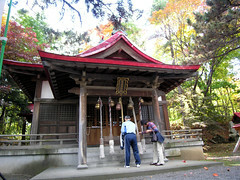 If the ceremony takes place in a Shinto shrine, the priest conducts a purifying ceremony for the couple. After the nuptial vows, the couple toasts each other with a cup of sake, known as the san-san-ku-do. One person makes a small speech to welcome the Bride before she makes her entrance into the shrine. There can be Bible readings of scriptures that have to do with love, but it is not necessary. The wedding vows, or seiyaku, end with the exchange of rings. The service itself can be in Japanese, English, or a combination of both. The procession ends when the Groom bows to the Bride’s Father and her Father bows in return. The Chapel registry is signed and the new couple is announced. They have a traditional wedding kiss, and usually there is one hymn sung, and a benediction. Although Christian or Shinto rites are included in this ceremony, those officiating often have no ordination. Guests who do not attend the religious ceremony can view it on a screen in the lobby of the hall. The wedding reception begins immediately after the ceremony, and lasts for exactly two hours. It is strictly planned and there are no random activities. The Bride and Groom sit at their table, and special guests approach the table and make speeches, sing songs, and can give a small performance, as long as it all fits into the two hour time frame. There is no big party where everyone drinks, dances, or gets to work the room to speak with other guests. Everyone stays seated at their tables unless they are approaching the Head table to speak or sing. The Bride changes her outfit three times. First she wears her white kimono or chosen gown to the ceremony. The couple’s first appearance as a married couple, after the ceremony, necessitates another change of outfit, and now the couple is joined by the nakodo, or matchmaker couple, who attended them. This couple’s name is on the invitations and symbolizes a stable marriage. When the married couple appears with them right after the ceremony, the two couples are surrounded by a special effect of white smoke and rosy pink lights on the dimmed stage where they will eventually be seated. A Master of Ceremonies congratulates the couple, introduces the nakodo, and then the opening speeches can start. These speeches are formal and concise. The first people to give speeches or toasts are closest to the couple. Then the couple cuts the wedding cake, and has one dance as Husband and Wife. Next comes the toast or Kanpai, and this is where the guests can relax more, eat and drink. Then more speeches of congratulations are given by friends and colleagues who are not as close as the first group who gave speeches. The Bride has changed into her third outfit now, and the man has also changed into a Western style tuxedo. This is the last outfit change for both of them, before the candlelight service. Both the Bride and Groom have a long, unlit candle, and will go to each table to light a candle where the guests sit. The first table where the candles will be lit is at the parent’s table. When all the candles at all the tables have been lit, the couple lights what is called the Memorial Candle. The two hours pass quickly, because the speeches, songs and dances fill the time. The end of the ceremony ends when the newlyweds present each of their parents with flowers in appreciation for being raised so well. So although some Western ideas are incorporated into the Japanese wedding ceremony, it is still very formal, and the strict protocol must be adhered to, as according to the formal, structured, way the Japanese do most things. Peer pressure is the norm in Japanese culture as well, because nobody wants to stand out and look different than their peers. It is a society where people find their comfort zone in knowing there is a correct procedure for every kind of occasion. So the wedding is most likely satisfactory to the couple, as they have added a few of their own touches to the day to make it special. The Japanese ceremony and reception have much less party time or socializing time than would be considered normal at a Western wedding. But it is an interesting blend of the two cultures, which likely is all that matters to the newlyweds. It really is nice, to take a little bit from each person in the family. I'm sure it gets everyone off on the right foot too. You know how planning weddings stresses out families so much! I thought it was interesting, so I'm glad others are too! Many people try to integrate two different cultures or religions into weddings, and I thought many of the things I read were very creative, each wedding a combination of the old ways and the new. Thanks for the visit! Glad you enjoyed. Take care.